AT OUTSIDE THE BOX, we take great pride in offering only the very best products available on the market. Our Doors are a perfect example of this statement. We sell only the best built doors, built on state of the art machinery, that assures every joint, every corner, and every finished door is built to the highest standards. Cabinet doors define the style and overall look in your kitchen. Before choosing countertops, backsplash, or flooring, you should choose the style, wood species, and color of your cabinets as they are the focal point of any kitchen. Different wood species provides a unique look to the wood when the stain is absorbed, so choosing the style of wood is important. With 12 different styles of door to choose from, you will be able to find the perfect style for your kitchen. We currently offer select alder, rustic alder, maple, cherry, hickory, and sapele. Check out our stains and tinted lacquers on select alder, rustic alder, maple, cherry, hickory, and sapele. Spice up your cabinet door stains with custom glazes. Our doors are all built with a Cope and Pattern or Miter joint. These are the finest joints available in the wood door industry. All of our wood doors are glued to a very specific pressure rating so that they have no loose or rattling panels or joints. At OTB we offer the very best quality door there is. If a door could be built any better, we would be doing it. All of our doors start as kiln dried solid wood. They are dried to a perfect moisture content, to assure that there will be no cracking or warping, under normal circumstances. The pieces for each door are then cut, and shaped in state of the art molders. The joints are then glued and nailed. After each door is built, it is put thru a sander to make sure it is perfectly sanded and ready for finish. Our finishes will only look as good as the door that we apply it to. So we make sure that our doors and our finishes are all on the same quality level. All of our Raised panel doors are solid wood, all the way thru. We do not substitute an MDF core on any of our raised panel doors, they are solid wood. 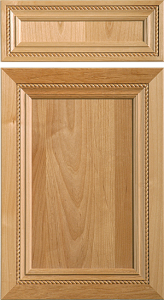 Our recessed panel doors are a solid wood frame with a ¼ inch center panel. This center panel is an MDF core material, that is perfectly suited for this application. The center panel will be the same wood species as the solid wood frame and will be an excellent match. We are very proud of the doors that we offer. Our Quality control is monitored every single day, so you can rest assured that we are doing our very best not to let anything slip by. You can rest assured that if you purchase doors from OUTSIDE THE BOX, you are buying the finest quality doors available today.